In honour of Migraine Awareness Month, please do NOT say any of these things to your loved ones who suffer from migraines. Not only does it not help, it makes it hurt more. 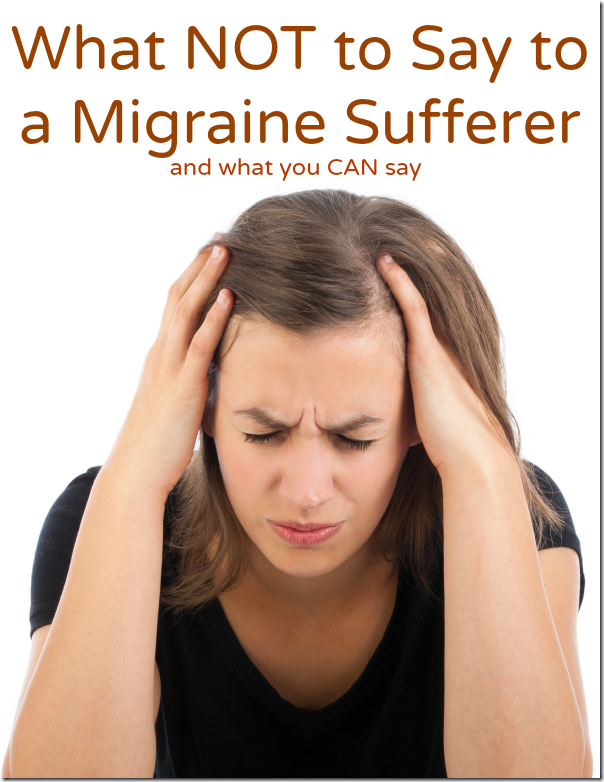 Migraines are debilitating, horrible things that I wouldn’t wish on my worse enemy. I can get them for 1 day or 5 days. I can’t think when I have them, it’s called brain fog. I’m nauseous, sometimes actually vomiting. My head feels like it’s going to explode, sometimes literally pushing against my head from the inside. Sometimes it’s so bad I have to lie down in a dark room with a cool cloth and NOT move a millimeter (1/8”) If I move even that much, the pain is searing. My neck hurts, my face hurts, my sinuses hurt. It’s horrible. I hope one day the medications that really DO help migraines can be more affordable for everyone or they find a cure. 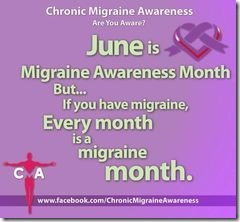 See what you can do to help spread the word about migraine awareness month.